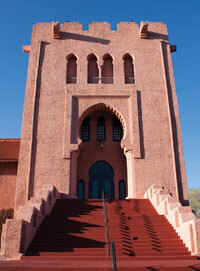 The massive pink Scottish Rite Temple anchors the north end of downtown Santa Fe like a Moorish citadel. That’s no surprise, since architects Hunt and Burns modeled the Masonic temple after the Alhambra in Granada, Spain. Thanks to that architectural ancestry, the 45,000-square-foot landmark harmonizes with the prevailing Pueblo Revival and Territorial Revival architecture codified in the capital city’s historic district. Built of poured concrete in 1912—the year New Mexico attained statehood—the temple includes a 400-seat theater with hand-painted mural backdrops, several large dormitories, a 3,000-square-foot commercial kitchen, and an enclosed courtyard. These features suggest future incarnations as a mixed-use condo/commercial development or educational center. Moorish arches and a crenellated parapet atop the main entry tower—where archers might repulse a siege—add to the enchanted-fortress mystique. Although owner Floyd Wilson hasn’t personally bumped into the ghost of the Major in the aptly named Casa Vieja (old house), other people swear that he exists. “He’s got epaulets on his shoulders,” Wilson says, explaining the apparition’s military apparel. The rambling 300-year-old home and restaurant is a landmark in Corrales. Built in the 1700s, its origins are “shrouded in legend,” Wilson says. With a curriculum vitae that includes possibly apocryphal engagements as a courthouse, insane asylum, brothel, and convent, the place sounds like an aristocrat’s dacha in a Dostoyevsky novel. During one renovation, Wilson says, workers chiseling into a thick adobe wall excavated a portrait of the Duke of Épernon; a similar painting of the 17th-century French nobleman hangs in the National Portrait Gallery in London. Who hid the duke’s image in the walls of a Corrales adobe, and why? Wilson implicates the Major in the house’s mysteries. “I’d be over there cleaning up, and I’d swear I’d lock a door, and the next time I’d go, it would be unlocked,” he says. Deemed a “cultural property” by the New Mexico Historic Preservation Division, and blessed by a structural engineer’s approval, the house is ready to go, says Wilson. Up the Río Chama, the sprawling Rancho de Abiquiú includes a gracious 12,000-square-foot 19th-century hacienda restored by premier builder and Santa Fe– style maven Sharon Woods. You enter the fortified courtyard through a classic zaguán, or gated passageway, typical of defensive haciendas on New Mexico’s Spanish frontier. Other buildings include a brick Victorian house, various casitas and offices, a full equestrian facility with an apartment and veterinarian’s office, Quonset huts, corrals, cattle-loading chutes, and scales—the works for an operating ranch. The ranch’s 263 acres extend along the fertile irrigated river bottom, below hulking black basalt mesas and craggy white cliffs that look like melted candle wax. Need a little more elbow room? You can add an adjacent 6,000 acres. The setting has enticed various Hollywood filmmakers, who’ve kept horses and livestock in the corrals for films like The Lone Ranger and Cowboys & Aliens. Steven Spielberg and George Lucas slept in the hacienda when filming Indiana Jones and the Last Crusade. If you bought this place—asking price, $7.5 million—it’d be like taking up residence inside a Georgia O’Keeffe painting. With 18-inch-thick adobe walls, 12-foot ceilings, tapered Doric columns on the porch, and a rooftop “widow’s walk” crowning the whole shooting match, the Frank Amador home in Las Cruces showcases southern New Mexico Territorial style, circa 1905. The defining trait might be the central-hallway floor plan, a design imported from the East as the military and the railroad brought ideas, tools, and craftsmen to the New Mexico Territory in the late 1800s. First, owner Frank Amador helped his father run the Amador Hotel, then he took over the livery stables and handled the town’s mail. Though recently renovated, the home’s unspoiled historical detailing includes the original front door and wavy-glass windows throughout. Amador House: 117 S. Miranda St. 3 bedrooms, 3 baths. $429,000. Land: .33 acre. Broker: Elaine Szalay, RE/MAX Classic Realty, Las Cruces; (575) 650-5151; mynm.us/amadorhouse. When Bob Brown bought the Jornado Ranch east of Truth or Consequences 30 years ago, he found an old piano in a crate in a lone building, a shed along the railroad tracks. “After thorough checking, we found the owner was General George Armstrong Custer’s wife,” he says. Around 1871, “It had been pulled off the train onto the siding and no one knew all those years.” That’s just an appetizer in the fourcourse history of Jornado Ranch, homesteaded in 1868. The cast of characters who passed through this land of wild horse herds and Native ruins could feature in a highlight reel of south-central New Mexico pageantry: Don Juan de Oñate, who in 1598 came to New Mexico as its first governor, trekked across the ranch along the dreaded Jornada del Muerto (Journey of Death), a shortcut on the Camino Real from Mexico City to Santa Fe. Oñate lost his son in a skirmish and buried him here; he lingered at the site for a funeral mass, says Bob’s son Jerry Brown, the ranch historian. Kit Carson rode and Bishop Lamy walked through the ranch. Billy the Kid left tracks and later, in 1896, his nemesis Sheriff Pat Garrett avoided a shoot-out with accused murderer Oliver Lee. Author Eugene Manlove Rhodes set part of his classic 1926 story about Garrett, “Pasó por Aquí,” on the ranch, where he courted some of the girls of the long-established area families, Jerry says. First an Apache camping ground, then a frontier mining outpost, and now a college town, Silver City boasts plenty of classic Victorian architecture. Architect-builder Robert Black, who built the Charles Ashton home on West Broadway in 1883, helped kick-start the trend. Black ran a planing mill that turned out fine woodwork, a key ingredient of the style, according to Silver City historian Susan Berry. This two-story brick home with steeply peaked twin dormers and gently arched windows—one with a lovely star ornament— radiates urban-frontier allure. Berry says Ashton operated the Centennial and Red Onion saloons and their associated gambling parlors. His wife, Lida, was an accomplished singer. The next owner, Jo. E. Sheridan, editor of the Silver City Enterprise, bought the place three years later. Today, an updated kitchen blends old and new with simple tile, contemporary appliances, and glass-front cabinets echoing Craftsman style. Modifications aside, this charmer maintains its Victorian-era modest elegance. Charles C. Poling is a contributing editor specializing in homes and architecture.